Just over two weeks ago, Mr. K got a stocking full of squeaky for Christmas. 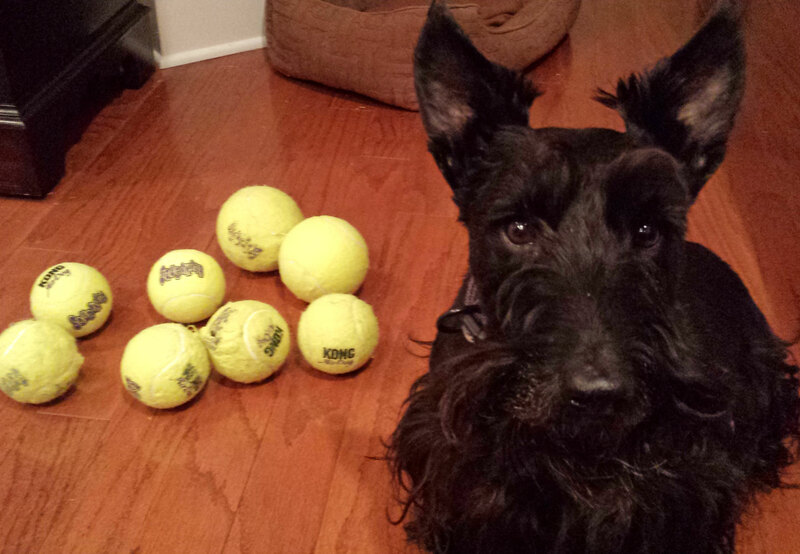 In total, he received about 16 brand new, Air KONG Squeaker tennis balls. You might remember seeing him shake out the coveted gifts from his stocking in this hilarious video. Mr. K might have looked like he was too happily confused to know what to do with all his new squeaky toys but don't let that video fool you. Mr. K knew exactly what to do with all those toys: destroy them! 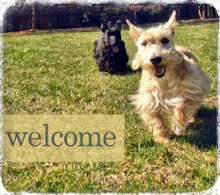 Had Scottie Dad and I left him to his own devices, there would be no squeaky tennis ball survivors today. Instead, we have rationed the supply and keep watch over him during squeaky ball play time. That has helped us preserve the life of these precious toys, which have so captured the heart (and teeth) of this silly Scottie. The plan, however, is not foolproof. Mr. K has defied the odds again and again, perfecting his kill-toy-time to just minutes...somewhere just under five, to be exact. We lost two squeaky tennis balls in one sitting when we weren't careful enough. That's when we had to up the game and make sure Mr. K spent more time chasing the squeaky tennis balls than going in for the kill. Alas, roughly 50 percent of the original squeaky balls remain today. Some that have survived this long are in pretty tough shape and may only have another five minute play session left in them. Others, like the larger ones nearly too big to fit in Mr. K's mouth, have faired better but no tennis ball is safe once Mr. K decides to destroy it. All I can say: may the squeakiest tennis ball win! I can destroy a regulation inflated soccer ball in under 45 minutes. I know the feeling. SIXTEEN brand, spanking new tennis balls!!! WOW, it really was Christmas at your house!! OMD! That video is so cute! With Maya and Pierson, it is about the same with their toys. They got the Ginormous squirrel which has six small squeaky squirrels. Three of them are missing an ear, one is missing a tail, all would have been destuffed by now if I hadn't been supervising their play. That video is cute. 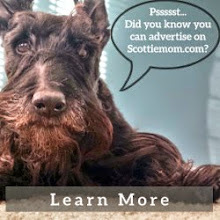 It looks to me as though a Scottie can never have too many squeaky tennis balls! BOL!!! The king of the Squeak strikes again!